The Tarrant County Health Department hopes to raise awareness of the dangers of children left in hot cars before temperatures in Texas really rise. Safe Kids Worldwide said Texas consistently ranks in the top three states for the number of children who die from heatstroke after being in a hot car. The Tarrant County Health Department said, since 1998, 92 children have died in Texas from heat stroke after being in a vehicle. There were five such deaths in 2013. The health department also said a child has already died from heat stroke this year. The health department put on a demonstration in its parking lot to educate parents and caregivers about the danger. Before temperatures really rise, the Tarrant County Health Department is being proactive in preventing heat deaths resulting from children left in hot cars. 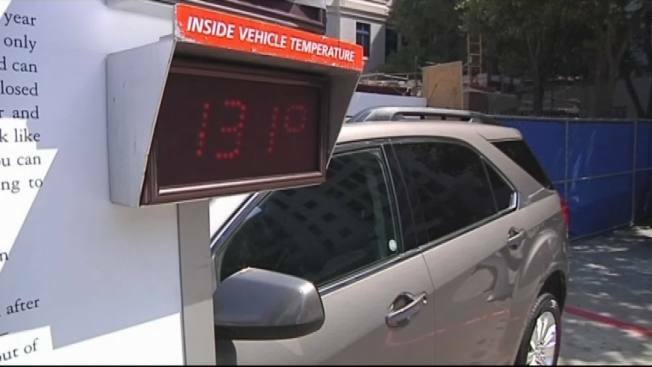 An electronic thermometer that displayed the temperature outside and inside a vehicle. When it's 80 degrees outside, it can still be more than 100 degrees inside a vehicle. A child's body temperature rises faster than an adult's, so what may be a short time in a warm car becomes dangerous, or even deadly, for a child. To avoid heat strokes, authorities first advise that children not be left in a car. To prevent against that, officials recommend parents put their briefcase, purse or cellphone in the back seat with your child. "Deaths from heat stroke happen far too often in Texas, as well as the nation. The incident is almost always unintended; no one intends to leave a child in a vehicle and have them be distressed," said Deputy Chief Jay Six with the Tarrant County Sheriff's Department. Authorities remind parents not all heat strokes are a result of caregivers leaving their child in a hot car. Tiffany Hays Dixon's son sneaked out of her house and got in a car to play. Her husband discovered him. "He was screaming at me, 'Give me the keys, give me the keys, call 911'" said Dixson. "He had found Riley sitting in his carseat in the locked car." Friday is the NWS's National Heat Awareness Day. Every hour throughout the day, National Oceanic Atmospheric Administration will use social media and the hash tag #heatstroke to send out prevention tips and facts about hot car safety. And if you see a child alone in a car without a parent you are urged to call 911.